It has been a long time since we have done a podcast!!!??? Seems like school is going to have a sports Festival this year too. Which most of the kids are really excited….. but not me.??? I’m in fifth grade now, and seems like I’m going to have to do a really weird kind of sports this year. It kind of makes me wonder why I even have to do it.?? It’s not popular either, so I bet that listeners that are not Japanese will be pretty much surprised about this weird kind of sports.??? What kind of sport is it? Listen to the episode and find out!!!??? ?… By Naho?? By the way, you can now find the English At Home Is Fun podcast on Spotify, iTunes, and Stitcher Radio! 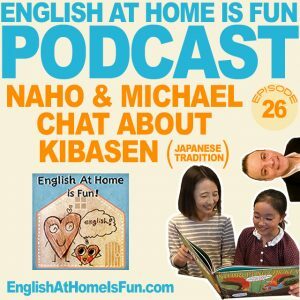 Click here to subscribe to the Happy English Podcast on iTunes! Click here to subscribe to the Happy English Podcast on Stitcher!